It’s a story we’ve all heard before. There’s some new exercise fad that’s sweeping the nation, with experts promising it’ll revolutionise the way we lose weight. It was vibration belts in the 60’s, aerobics in the 70’s. Infomercials brought us dozens more in the years following. But now, there truly is an exercise we can all do. And it turns out you’ve been doing it all along without even realising. 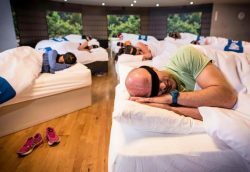 By combining the positive elements of stretching and sleep, the fitness gurus David Lloyd Gyms have come up with… NAPERCISE. The idea is you set yourself up in a nice room, with relaxing music and comfy beds. Have a slow stretching session, then take a well earned nap. Sounds like tough work.